Garland, Texas – On May 4th Elton Simpson, 30, and his roommate Nadir Soofi, 34, opened fire on an unarmed security guard outside of a controversial Prophet Muhammad drawing the contest. 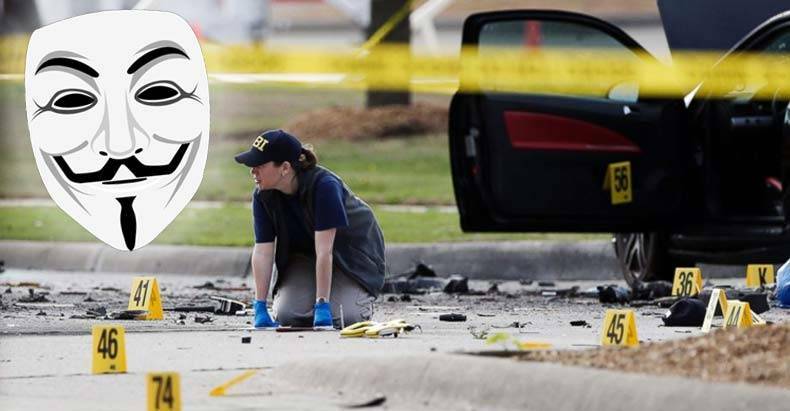 Two days prior to that, a woman living outside of the US, connected to Anonymous, sent a message to the official Garland Police Department Twitter account warning of a potential Islamic State attack. Apparently the message never raised any red flags or was forwarded on by police. The Muhammad Art Exhibit and Contest was, in actuality, a Muhammad drawing contest being held under the auspices of free speech. It would be considered blasphemous and a direct provocation to Muslims, as it is forbidden within Islam to create physical representations of the Prophet. It is widely thought that the January attack on satirical French paper Charlie Hedbo was a direct result of their humorous cartoon depictions of the Prophet. Anonymous has shown a penchant for targeting Islamic State accounts on Twitter and has numerous IS-related groups that regularly attack and track the terrorist group on social media. On Friday, the user discovered that another Twitter account, @AnsarAlUmmah49, had referenced an upcoming attack in Garland, where a group of Americans were planning a “draw Mohammad” event. So the user tweeted to @garlandpd with a link to the tweet in question, which called for an attack, specifically in Garland and on May 3. @AnsarAlUmmah49 has since been deleted. Although the Garland PD apparently didn’t get the Twitter message, it appears that law enforcement was fully aware of the plot, as they had teams on the ground to take out the shooters immediately after the attack began. But this also raises some deeply troubling questions. Why, if teams were on the ground and aware of the imminent attack, were these men allowed to open fire before being neutralized by law enforcement? If the operation was conducted in the name of public safety then these men should have been taken into custody well before they actually attempted to execute an attack. It would seem that law enforcement allowed the attack to take place, but why would they do this? One possible explanation is that they allowed this plot to progress to the point of actual gunfire with the intention of creating a media sensation of a terrorist attack. This has been proven in the past to make people more fearful and thus more readily willing to give up civil liberties in the name of safety. What’s certain is that Americans are tired of our government spying on them. Perhaps the state is attempting to justify why they have these blanket surveillance programs listening in on innocent U.S. citizens’ conversations. What do you think; did the government allow this attack to take place as a means of making people more willing to give up security for the illusion of safety? Let us know in the comments below. Please share this story if you think this “attack” was intentionally allowed to happen.